I finally have a chance to catch my breath and jot something down here. Things have been kinda crazy lately, so I'm only able just now able to properly collect my thoughts from the last few weeks. A lot of cool stuff happened that I wanted to share with you. We'll start with the book reading, then dive into our trip to PlanetCon 2016 and finally end on a look-ahead for what's coming next. Be warned: this post is link heavy. Keep track of those browser tabs. 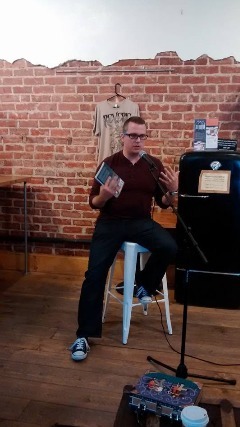 The book reading at Reverie went over fairly well. We had a few things working against us though. The sound equipment wasn't ready. The coffee shop was unusually busy for a Thursday night, so it was really loud. Lastly, they kinda put us in a back corner that made it even harder for folks to hear us read. Despite that, my family and I had a great time. I had never done anything like it before, and it took me a bit out of my comfort zone. I learned a lot just in prepping for the reading. Not only that, I connected a little more with some local author buddies. And I got to hear readings from two genres that I don't very often: paranormal romance and literary. I enjoyed the unique voice of the other two authors reading that night. Overall, it was a fun experience. Some friends came out to partake, I got to show off to my wife and daughter (always a plus), and I even sold a couple of copies of my latest book, Unplugged and Unfinished. ​Last year marked the first time my wife and I have ever been to a comicon. That isn't to say we've never had the desire to go. Growing up, I read a wide variety and large volume of comics (and still do to this day), but I always stayed so busy with school, sports, what-have-you that we never really made it a priority. The only geek conventions I had ever heard about were the likes of Star Trek, San Diego Comicon and E3. None of these occur even remotely close to us. 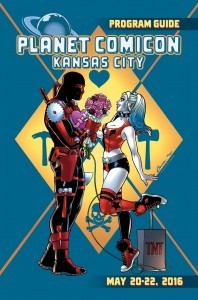 Over the last couple of decades, we've seen a rise in all manner of conventions, including one in Kansas City called Planet Comicon, or PlanetCon for short. ​Our experience last year was a bit overwhelming, to say the least. The con was huge. Booths everywhere, cosplayers of all shapes, sizes and colors, celebrities, panels, artist alley and terrible con food. A lot to take in, but we had a ton of fun, and we resolved to return. This year, we felt like old pros as we waded through the mass of con-goers. Our big goal this year was to meet our favorite voice actors, Nolan North and Troy Baker, which we accomplished. We got to sit in on their panel, take a combo photo with both of them and spent time chatting with them. Both guys are hilarious and great conversationalists. And yes, Nolan North really is Nathan Drake. I did get a chance to see the living legend, Stan Lee get a selfie with Lou Ferrigno (AKA the Hulk). I wanted to take a photo of the occasion so badly, but the three muscle-bound goons surrounding Stan told this would be a bad idea. I have a soft spot for indie artists, so we made several forays into the artist alley. We met a number of interesting folks there, but the highlights were Brian Gordon (creator of the always hilarious Fowl Language webcomic), nooligan (a very cool artist that has a nice, clean retro style), and the very sweet Tori Gedvillas (whose drawings my three-year-old had to have). To round out our trip, we got to mix business with pleasure in meeting the fine folks of Wordfire Press including Kevin J. Anderson, Quincy Allen, D.J. Butler and last, but certainly not least, Jim Butcher. I got to meet Bryan Thomas Schmidt, the first editor for The Martian. He had a lot of great advice for aspiring writers; his words still float around the forefront of mymind even as I write this. Connecting with other authors at various stages in their careers, from fairly newly published writers to seasoned bestsellers, left my head spinning with all the great information and discussion. A major thanks to the great folks who put on the con and the wonderful celebrity guests they brought in. We had a wonderful time. Getting to meet all the awesome folks at the con gave me more fuel to get my rear in gear. Among the things I have in the pipe (see the In-Work Projects section of the site for a full list), my next focus will be on getting the second edition of my first book done. The cover art is pretty much finished (Will I show it to you? Nah, not yet. Soon, but not yet). I have about 1/4 of the text to finish editing. After comes another quick editing run using some software for extra tidiness before finally getting the text into a book template and sent off to CreateSpace. Once this is done, the short story I want to do for Hugh Howey's Sand. universe on Kindle Worlds has been screaming at me for weeks, so that will be on deck for a draft. Finally, after that's done, I need to get back to The Cartographer. Been dragging my feet on that one. That's all for this time folks. See you next time.